Figure 5 Sixty-two-year-old man with prostate cancer and postbiopsy hemorrhage. (A) Axial T1-weighted and (B) axial T2-weighted images reveal a low T1- and low T2-signal intensity cancer (thin white arrow) in the left paramedian region of the midgland. Postbiopsy hemorrhage manifests as high T1- and low T2-signal intensity methemoglobin (black arrows) in the left and right lateral aspects of the midgland. Although prostatic enlargement is not required for these symptoms to be manifested, glandular enlargement, increased smooth muscle tone, and decreased pro-static compliance have been implicated as etiologies leading to clinical presentation (56). 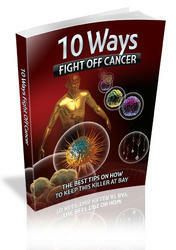 Treatment options include surgery, minimally invasive procedures (laser surgery), and such medications as alpha-adrenergic blockers and androgen blockade (56,57). MRI features associated with BPH include marked enlargement of the central gland and "median lobe'' hyperplasia. The MR appearance of BPH is dependent on the ratio of glandular and stromal tissue in the central gland, resulting in nodules of varying sizes and varying signal intensities in the transitional zone or periurethral glands (56). Sclerotic or fibromuscular BPH has low T2-signal intensity nodules because of a high concentration of collagen and smooth muscle, whereas glandular hyperplasia is characterized by high T2-signal intensity nodules due to dilated glandular elements (Fig. 6A) (56,58-60). The most common type of BPH actually contains both mixed glandular and stromal tissue (Fig. 6B). Although the majority of prostate cancers occur in the peripheral gland, a small percentage of tumors can coexist with BPH in the central gland. These tumors are very difficult or even impossible to diagnose on MRI, because they are surrounded by the mixed signal intensities of the pro-static tissue in the adjacent central gland. Although MRI is not routinely used in evaluating patients with BPH, it has two potentially important roles in the management of these patients. Treatment decisions are partly based on prostate size and type of hyperplasia. For surgical intervention, a large prostate size may direct a patient to open prostatectomy rather than transurethral resection (TURP) (56). MR estimates of prostatic volume can be used in the selection of treatment and in determining response to treatments, such as androgen deprivation. MRI has been shown to be more accurate than transrectal ultrasound (TRUS) for volume determinations when using the formula for a prolate ellipse [volume = (AP x TRV x CC) x 0.52] (61-63). MRI may also be valuable in determining which patients will respond to a specific medication regimen based on the morphologic composition of the BPH. Alpha blockers are more effective in patients who have smaller prostates and more smooth muscle hyperplasia, whereas androgen deprivation using 5-alpha reductase inhibitors is more effective in patients who have larger prostate glands and more glandular hyperplasia (56,57). A recent study showed that MRI performed in patients who failed to respond to alpha blockers helped determine whether a patient would sufficiently respond to antiandrogen therapy based on the presence of high T2-signal intensity nodules (reflecting a greater percentage of glandular elements) (57). 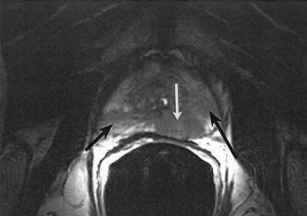 Acute bacterial prostatitis can be mistaken for prostate carcinoma on MRI because of similarities in the appearance of both entities. Acute bacterial prostatitis is rare but can result in either a low signal intensity lesion in the peripheral zone on T2-weighted images or ground glass homogeneous low T2-signal intensity in the central gland (64-66). Chronic bacterial or nonbacterial prostatitis (which is more common than bacterial prostatitis) can be associated with an atrophic seminal vesicle. This condition results either in a diffuse striated area of low T2-signal intensity or in patchy curvilinear regions of alternating high and low T2- signal intensity (Fig. 7). Patients with chronic infection are less likely to be misdiagnosed with cancer because of the diffuse extent of disease and lack of mass effect (66). Figure 6 Two different patients with (A) glandular BPH and (B) mixed glandular and stromal BPH. 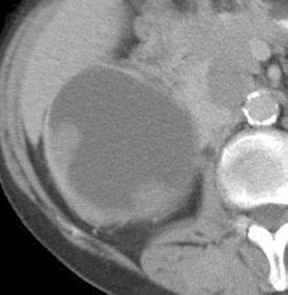 (A) Demonstrates cystic or glandular hyperplasia, which is characterized by high signal intensity nodules (black arrow) on this axial T2-weighted image. Stromal hyperplasia depicted in (B) has low signal intensity areas on this axial T2-weighted image because of a high concentration of collagen and smooth muscle (black arrow) as well as glandular hyperplasia. Abbreviation: BPH, benign prostatic hypertrophy. 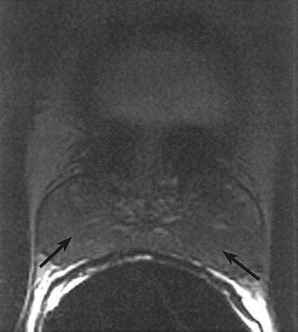 Figure 7 Prostatitis in a 20-year-old man. Axial T2-weighted image demonstrates abnormal diffuse low signal intensity throughout the entire peripheral gland (black arrow), representing prostatitis. Abscesses of the prostate gland are rare, are found in elderly men, and usually result from inadequately treated acute bacterial prostatitis caused by Escherichia coli. Physical examination may reveal the diagnosis if there is fluctuation of the prostate on rectal examination. On MR imaging, an abscess is of low signal intensity on T1-weighted imaging and high signal intensity on T2-weighted imaging, occasionally mimicking a cyst (65,67). Granulomatous prostatitis is an uncommon inflammatory disease of the prostate gland, which may also be mistaken for carcinoma because it manifests as nonspecific low T2-signal intensity lesions in the peripheral zone. Although the etiology is unclear, granulomatous prostatitis can be due to infection (hematogenous spread of mycobacterial tuberculosis) or surgery (TURP) or can be a local manifestation of a systemic granulomatous disease. Due to the lack of specificity on imaging, definitive diagnosis requires biopsy (68). Cysts of the prostate gland are uncommon and are classified into either congenital or acquired subtypes. The congenital cysts that will be discussed include Mullerian cysts, utricle cysts, and seminal vesicle cysts (Wolffian duct anomalies), whereas acquired lesions include cysts of BPH, prostatic retention cysts, ejaculatory duct cysts, and rarely cystic carcinoma or infection (69,70).